“It’s the most wonderful time of the year…”. Christmas! Navidad! The festive season makes those brief December days and long dark nights somehow easier to handle. Or, maybe it’s just that we aren’t two months into the winter season and really tired of looking at gray skies, dirty sidewalk snow, and birdless bare branches. But that stuff is for the northern realms, not for warm and tropical Costa Rica. Around here, in December, we only need worry about how many birds we can find during our annual Christmas Counts! Yes, this really is the most wonderful time of the year for many of us local birders and it has everything to do with our “conteos de aves”. I know that the annual count is special for many a birder in many places but seriously, here in Costa Rica, we tend to kick it up a notch. Not just a day to get together and count birds, our counts tend to me more like events that bring dozens of birders together whether they are official registered Audubon counts or not. 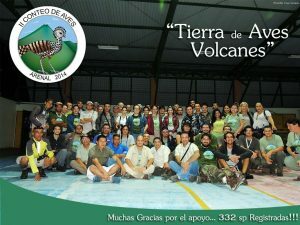 The Arenal event is one such count. 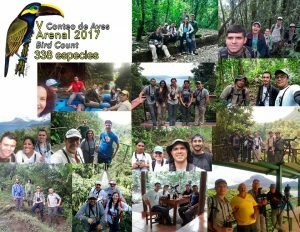 Although it’s not officially registered as an Audubon count circle, we carry out the count in similar fashion and use it to gather data and promote birding in the Arenal area. It actually starts well before the count date with the count organizers contacting hotels and agencies that might be interested in sponsoring the count, registering counters, seeing where various people can stay, and then seeing which person will lead which route along with assigning people to each route. Oh yeah and then there is the catering but I’ll get to that later. The routes for the Arenal count cover everywhere from the La Fortuna surroundings to the Hanging Bridges, Sky Trek, the Observatory Lodge, Arenal Lake, and even a rafting count on the Penas Blancas River. Basically, fantastic birding everywhere and with every route recording well over 100 species. Sound enticing? It sure is and is why this count sees more than 70 people participating each year. The first year of the count, 2013, actually had the highest participation with 95 birders in the field. Last year, 71 people were counting birds, probably less than other years because of other counts taking place at the same time. However, even with less participants, we still had 338 species for the count circle, around average. That said, our highest total was 377 species in 2016 and with the right combination of weather and participation, we could certainly record even more. Regarding species, this one is also exciting because it’s one of the few counts in Costa Rica that finds birds like Uniform Crake, Lanceolated Monklet, Song Wren, Bare-necked Umbrellabird, Fork-tailed Flycatcher, and Bare-crowned Antbird on the same day! Last year, our group got the monklet although it can turn up on at least three or four routes. Once everything is ready, people confirmed for the annual Arenal count get together in La Fortuna for a meeting held the night before the count. This has taken place at hotels, in a gymnasium, and even at the local market and is vital for socializing with other counters, going over the routes, and seeing a presentation that talks about the official count species and research being carried out in the Arenal count circle. This is accompanied by coffee and cookies as counters try on tee-shirts that show the official count species on the front and logos of count sponsors on the back. It’s always a cool, unique shirt and it ends up acting as valuable marketing for the hotels and travel agencies that support the bird count because believe me, those count shirts get around! I have worn more than one of mine on trips outside of Costa Rica as well as within the country and since the shirts are unique, people do notice and even ask about them. 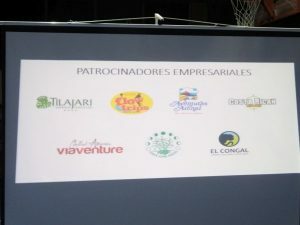 Over the years, the Arenal count has gotten support from 6 public institutions and 30 private enterprises, I wonder who the lucky sponsors will be this year? After the pre-count meeting, birders meet up with their respective count leaders to figure out if they should start counting in the middle of the night or wait until dawn. Personally, I prefer to start around 3:30 at beautiful Finca Luna Nueva, the route I usually do. Then, everyone heads off to their respective places for lodging to hopefully get some sleep before count day. On count day itself, the birding is often an exciting blend of fast and furious avian action between bouts of pouring rain. Last year gave us a break with the weather and because of it, we managed several owls along with a wonderful sunny day of birding. Counters usually finish up around 4 or 5 and then head to the count dinner. This is typically a catered affair where we are served that Costa Rican staple rice with chicken, refried beans, and some potato chips along with a bit of salad. It’s good birding food and seems to work perfectly after a long, fantastic deal in the field. Some count sponsors are also present and can have tables with optics, brochures, and works of art. Eventually, once it seems as if all are present, we go through the bird list, mentioning each species and each count group raising a hand if they identified the bird mentioned. 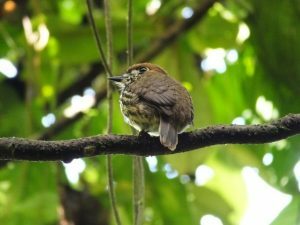 Stories and locations for rare birds are shared, and another birding event in Costa Rica comes to an end. These words could never portray the true excitement of this count, a day when we give ourselves over to birding in an excellent area for birding. 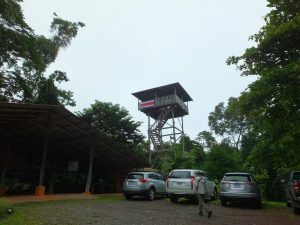 However, if you can imagine seeing more than 150 species of birds, one species coming after another, trees of toucans, flocks of Red-billed Pigeons, antbirds whistling from the dark understory of rainforest, Red-lored Parrots filling the air with sound as three species of parakeets zip by in screeching flight, an Ornate Hawk-Eagle calling above a tall jade canopy, and sharing this and more with friends, loving partners, and like-minded people, if you can imagine that, this is what the Arenal count is like. It’s happening this year on December 8th, it’s gonna be good!